The little wooden ornaments I painted for my little girls that they now hang on their trees. The Christmas plate three of my grandchildren painted for me. The live Christmas tree my husband and I purchased the first year of my marriage and how our son planted that tree in the front yard. How quickly it grew and how sad it was when we drove by the house years later and saw the new owner had cut it down. One special Christmas remains in my heart forever – Christmas of 1968. My boyfriend had just completed basic training at the USMC base in San Diego, California and was coming home on Christmas Eve. He was traveling home by bus and his parents were going to call me as soon as he let them know he was at the bus station in St. Louis. They would then swing by and pick me up and we would go to get him. It was late when the call finally came and I was so excited! After we picked him up at the bus station we hurried to his home where his eight brothers and sisters were anxiously waiting to see him. By the time the family reunion was over it was early morning Christmas Day and Lonnie got the keys to the family car to drive me home. Sitting in the car before I went inside he asked me to marry him. Sadly, the wedding would not be for a while as he was headed to Vietnam shortly after the New Year. The holidays were both happy, but sad. So good to be together, to celebrate our engagement. So sad to face the months ahead of separation and danger for him. Would he survive the war? Would we really be married? This Christmas I think of all the service men and women who are far from home protecting our country and of their family – parents, spouses, children — who will have an empty spot at their table. If you know someone who is serving overseas, send them a card and let them know you are thinking of them. If you know a family who has a member who will be absent this year at the festivities, give them a call. Encourage them and share your appreciation of the sacrifice both they and their family member are making for us. My story had a happy ending. After 13 months my Marine returned home and we were married. It started with Claudine. Claudine was a young high school student living in Cebu City, Philippines. Through Compassion’s program to help release children from poverty, I began sending a monthly contribution to help meet Claudine’s educational and physical needs. While in high school Claudine attended the Cornerstone Student Center. Through the Center – in cooperation with Compassion – Claudine enjoyed good and helpful medical check-ups, help with school work, learned life skills such as cooking and baking and assistance in job applications. With their help, she filled out her “My Plan for Tomorrow” workbook helping her to plan her future and set goals. Extra-curricular activities were provided that helped her explore her God-given talents. We enjoyed years of letters and pictures sent back and forth. It was a bitter-sweet day when I received her last letter. She had graduated from school, had a job and was now moving out of the Compassion program. She was making plans to pursue a college degree. She thanked me for the monthly sponsorship, for the birthday, Christmas and family gifts, but when she told me what she was most thankful for, tears came to my eyes. What I will miss the most are your letters where you tell me about your life and what’s happening. She said she hoped I would still sponsor another needy child like her. I will never forget you and I will always love you and your will be forever in my heart. So – in honor of Claudine and her hard work and faithfulness to God and her family, I chose another little girl from the Philippines. 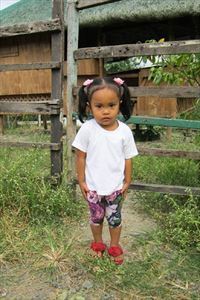 This time I decided to pick a little girl much younger than Claudine had been when our sponsorship started. This would give me more years to develop a relationship with her and help her from the very start of life. It is also nice that Rachell Ann is only 5 months older than my youngest granddaughter, Zoe. Rachell Ann lives just east of Quezon City. Because she is so young her mother writes to me for Rachell Ann. Very interesting to see that the place she would like to visit is the same as many kids in the USA – Disneyland. But the chances that she will ever be able to do that are pretty small. While I can’t help her with that dream, I’m grateful that I can help see that this little girl has a better chance of growing up healthy and educated – and know the love of God. I’m not posting this story to “brag” about what I’m doing. I’m hoping you will read and decide that you, too, can help bring a child out of poverty. It costs us so little – it means so much to others. Check out the Compassion, Inc. site. See what you can to do to help a child – and therefore a family, be lifted up from poverty. Even Children Can Make a Difference! The young people from Bethel Assembly of God standing with their barrels with funds raised for BGMC this past Sunday! Boys and Girls Missions Club (BGMC) is the missions program my church uses to teach the children to love the world – not just our own country – and to do what they can to make a difference in the lives of others. Funds raised by the kids do what you would expect a missionary organization to do – share Bibles, Christian curriculum and teach the Gospel of Jesus Christ to the communities where the money goes. But just as Jesus did when He was on earth, the children also help to meet many of the “here and now” physical needs such as providing food, digging wells and providing help to the local church workers. Buddy Barrel is the mascot for BGMC. Buddy was created in 1949 when the club shipped supplies to missionaries in barrels. The barrels kept the supplies from getting ruined in route to their destination. At first small wooden barrels were created for the children to save their coins in. Today the barrels are now yellow plastic barrels. Each month the children are encouraged to bring in the money they have saved in their barrels. But what can little children do to make a difference? A lot! The following is just a small list of what the children have done with their fund-raising. This program is not just a fundraising program. 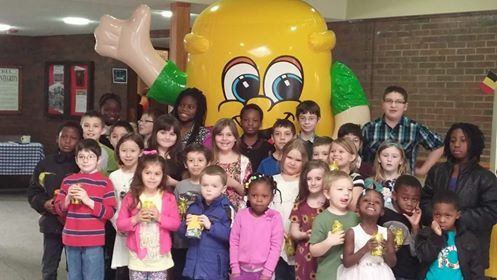 Through BGMC the kids learn about the needs of others around the world – teaching them to go beyond the “me-centered” world they experience growing up in the USA. So far this year the children have raised $273,588.64 for the world! Little children CAN and DO make a difference. So – what are you doing to make a difference? The following is taken from the book “The Hole in Our Gospel’ written by the president of World Vision, Richard Stearns. It speaks much better than I can of our need to make a difference. I have expressed my thoughts on this topic in other posts: What is on Your Menu for the Christmas Meal? and Poverty – It’s Real! “It is hard to read the headlines each day without a growing sense of alarm. We hear about terrorism, ethnic and religious tensions, wars and conflicts, corrupt governments, massive natural disasters, climate change, nuclear intimidation, and even child trafficking and slavery. Our post 9/11 world seems both frightening and threatening, and the majority of us struggle to understand it, let alone do something about it. The world’s problems just seem too big and too hard for most of us; it’s so much easier to retreat from them than to take them on. On Sunday morning, safe in our church pews and surrounded by friends, it can be all too easy to leave the world’s violence, suffering, turmoil outside–out of sight, out of mind. But wait–as Christians, are we really given the option of turning away from the world’s problems? Does God permit that? The ideas behind The Hole in Our Gospel is quite simple. It’s basically the belief that being a Christian, or follower of Jesus Christ, requires much more than just having a personal and transforming relationship with God. It also entails a public and transforming relationship with the world. If your personal faith in Christ has no positive outward expression, then your faith–and mine–has a hole in it. Embracing the gospel, or good news, proclaimed by Jesus is so much more than a private transaction between God and us. The gospel itself was born of God’s vision of a changed people, challenging and transforming the prevailing values and practices of our world. Jesus called the resulting new world order the “kingdom of God” and said that it would become a reality through the lives and deeds of His followers. Jesus asked a great deal of those who followed Him. He expected much more from them than just believing He was God’s Son. He challenged them to embrace radically different standards, to love their neighbors and their enemies, to forgive those who wronged them, to lift up the poor and downtrodden, to share what they had with those who had little, and to live lives of sacrifice. Then He likened their effect on the world around them to that which light has on darkness. Light dispels darkness; it reverses it. Those who choose to follow Christ have struggled since the very beginning to live differently in a world that often rejects their values and mocks their belies. The temptation to retreat from it and to keep our faith private has befallen every generation of Christians. Yet we are the carriers of the gospel–the good news that it was meant to change the world. Belief is not enough. Worship is not enough. Personal morality is not enough. And Christian community is not enough. God has always demanded more. When we committed ourselves to following Christ, we also committed to living our lives in such a way that a watching world would catch a glimpse of God’s character–His love, justice, and mercy–through our words, actions and behavior….. Living out our faith privately was never meant to be an option. Whatever Happened to the Ebola Crisis? 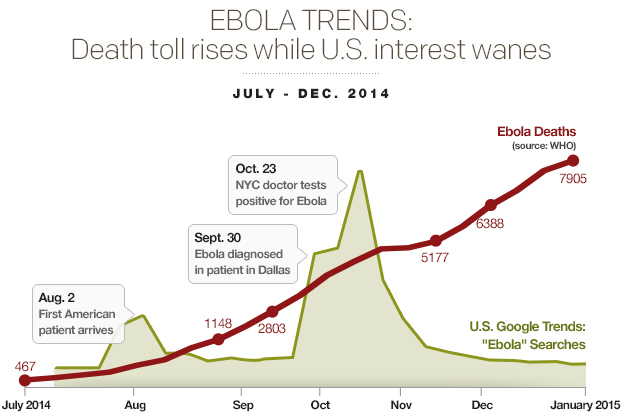 For days all we heard on the cable news was concern about the Ebola crisis. Then – suddenly nothing! We Americans have such short attention spans and the news media seems to be able to only concentrate on one news item at a time. Whenever something shocking or dramatic happens, it is as if everything else in the world does not exist. And, quite frankly, unless it threatens our lives, our comforts, we Americans don’t seem all that concerned. The chart above is from data compiled by Google and it shows how interested our country was when several people here were infected with the virus. However, as the cases of Ebola in the USA were contained, we lost interest. Ebola still is a crisis in West Africa! Along with the deaths, more than 20,000 have fallen ill with the disease. It is estimated that six out of ten who are currently ill with the disease will die and many still are not getting any medical care. Entire society is changed by this crisis! We think only of the tragedy of the deaths in this situation. However, even after the disease is brought under control, there will remain long-lasting effects for West Africa. Oh well – it doesn’t affect me! Strange how churches were praying about the crisis when it looked like the virus might threaten the USA. But, now I do not hear any prayers being given for the crisis. It doesn’t affect us – so we are back to praying about things that concern us.